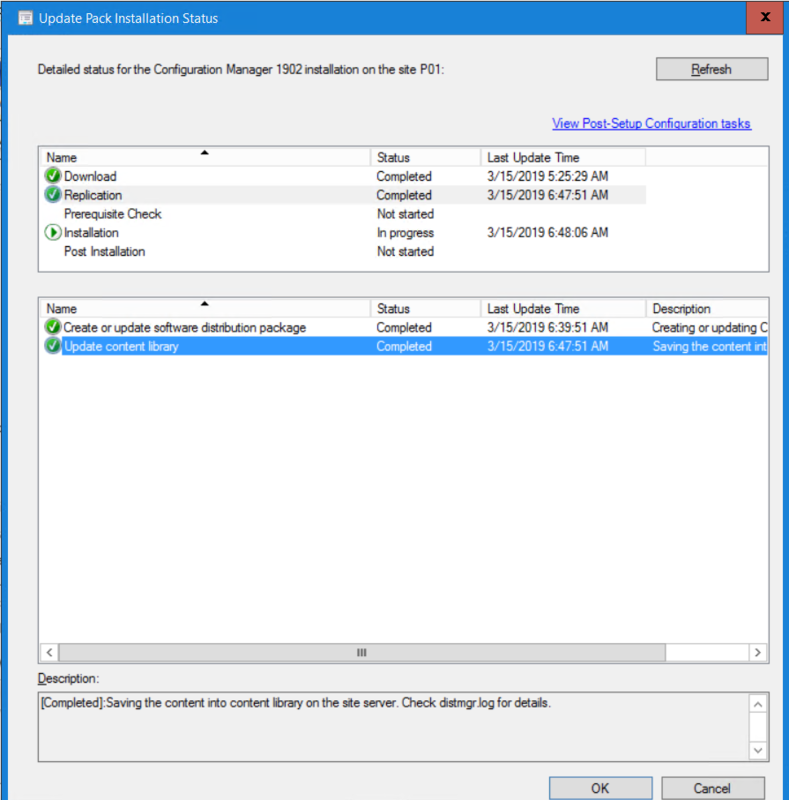 In a previous set of guides you used PowerShell scripts to quickly install System Center Configuration Manager (Current Branch) version 1802 and then upgraded it using Updates and Servicing to System Center Configuration Manager (Current Branch) version 1810. 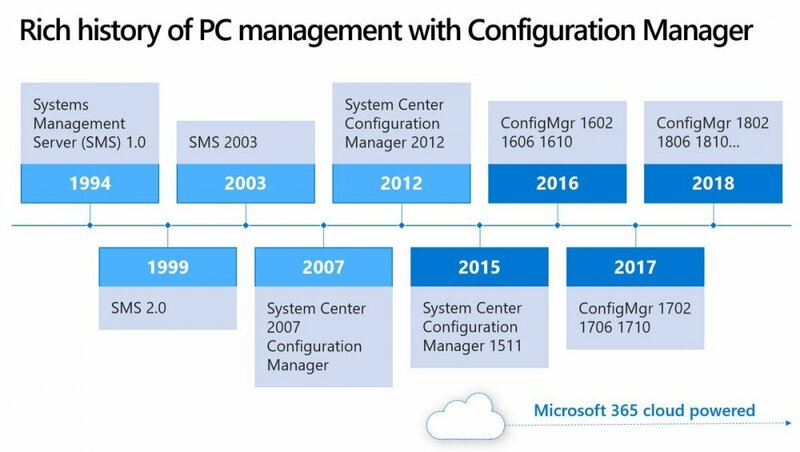 Configuration Manager has a rich history that is nicely explained in the following graphic (from Twitter). Tip: You have rights to use System Center Configuration Manager (SCCM) to manage clients covered by the EMS license. Make sure you stay on #ConfigMgr current branch to receive benefits of Microsoft cloud, more info here. 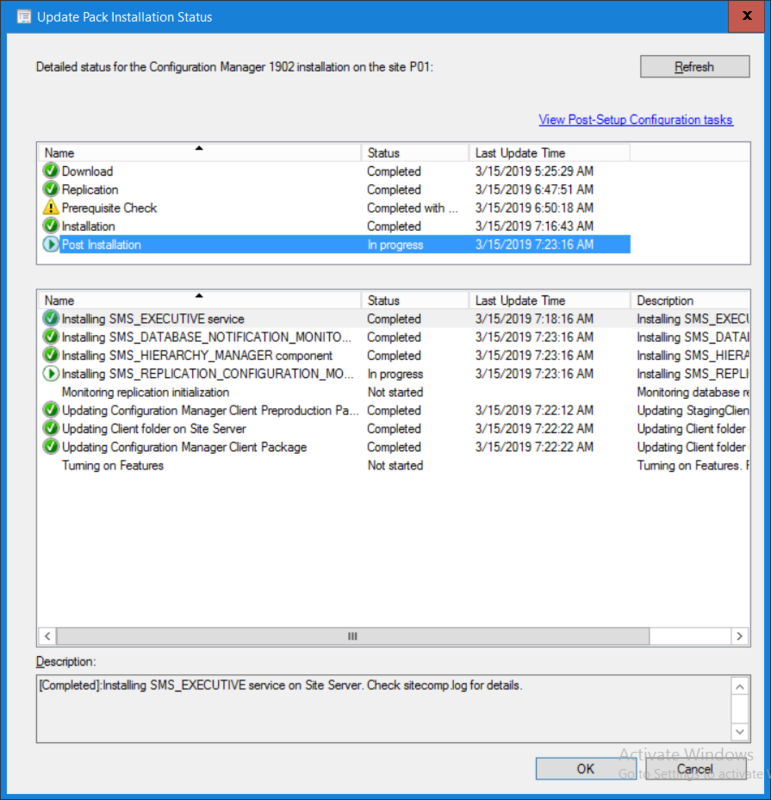 System Center Configuration Manager (Current Branch) is designed for use in production environments, for managing anything from small to very large Enterprises, whereas System Center Configuration Manager (Technical Preview) is for lab testing environments only and is limited to 10 clients. The Technical Preview releases are released monthly, and contain the latest and greatest features being trialed in the product, and usually these new features are the result of feedback from uservoice. Current Branch releases on the other hand are released only a few times per year and contain stable, tested features that are mature enough to release into production environments. Microsoft have released the latest Current Branch offering known as Update 1902 for Configuration Manager current branch so it's time to upgrade again. This release is the new baseline release (and will of course be uploaded to MSDN and VLSC soon). To understand what baseline releases are and why they are important see this post. 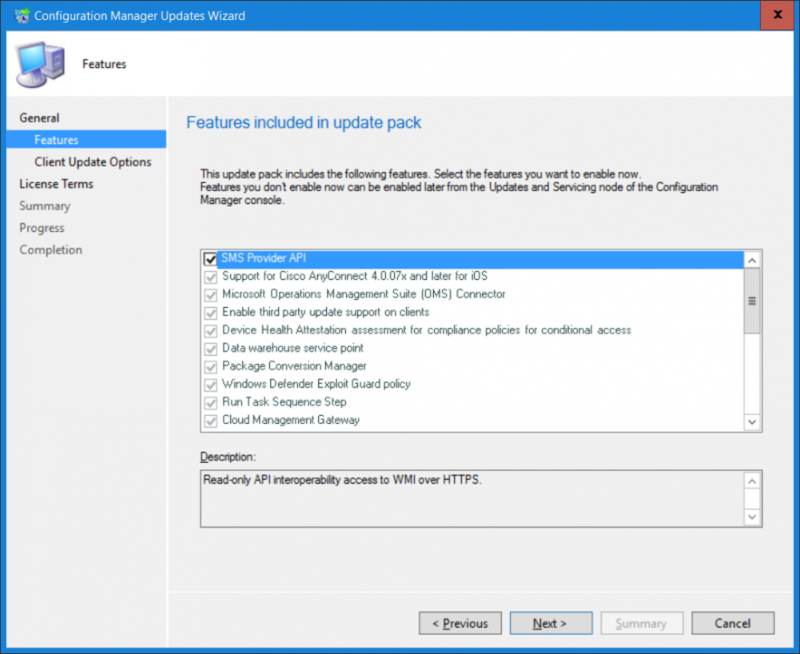 Baseline releases media are used when doing New installs or upgrades from supported versions of SCCM. Before starting the upgrade, please verify that you have read the checklist from Microsoft here. When new Current Branch releases are made public, you have the choice of getting it immediately using a fast ring PowerShell script, or to wait a couple of weeks until it is made available to the slow ring (and then show up in the ConfigMgr console). To use the fast ring PowerShell script, download it, and run it to self-extract to C:\EnableFastRing1902. Once extracted, start a PowerShell cmd prompt in that folder and from there use the following command (where CM01 is the <SiteServer_Name | SiteServer_IP> of your CAS or standalone Primary site server). Tip: Some antivirus programs, particularly 3rd party (non Microsoft) antivirus programs can cause issues with the upgrade. If you have a 3rd party antivirus program installed on your site server, please disable (or temporarily uninstall) it prior to running the upgrade. To start the upgrade open the ConfigMgr console and find the Updates and servicing node as shown here. 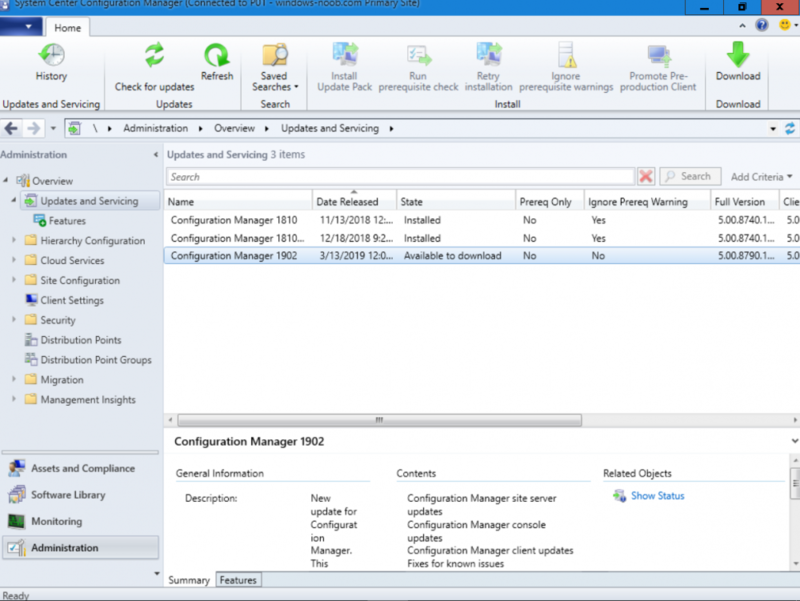 You can see that Configuration Manager 1810 Current Branch is already installed. Click on Check for Updates in the ribbon. 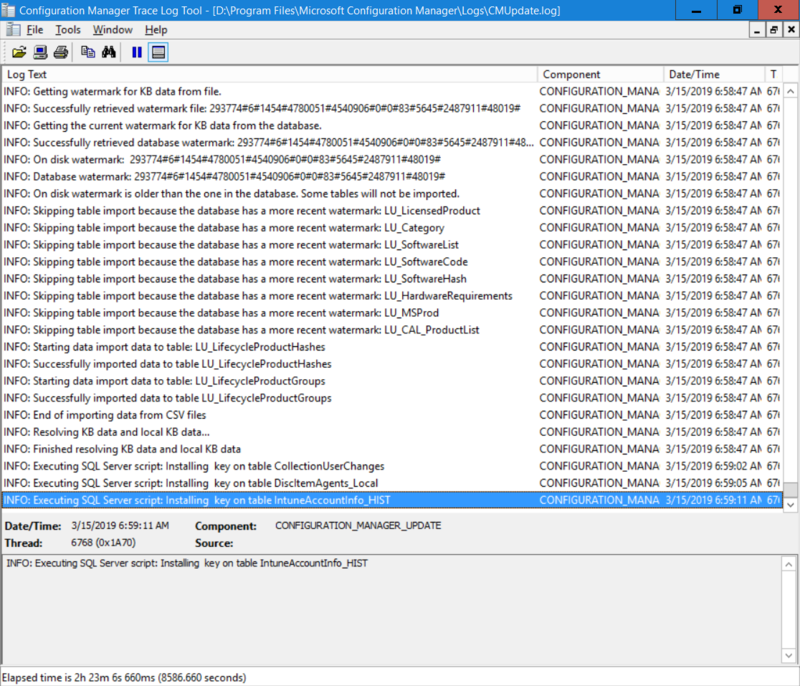 And as instructed in the popup, open the DMPDownloader.log using CMTrace to monitor the process of checking for updates. Here you can see Generating state message: 6 which highlights that it’s found an applicable update. Once it's found if you refresh the console you'll see it listed. In the ConfigMgr console you’ll see it’s in a state of downloading or available to download, if it's not downloading yet, right click to download. Once it has completed downloading it will be listed as a state of Available. You need to click refresh in the ConfigMgr console to update the view. The state will change to Ready to Install once it has downloaded all the content. Right click on the update and choose Install Update Pack. when the Wizard appears, make your choice for pre-reqs and click next. Review the features included in this update pack and select those you want to use. Note: You may also notice Pre-Release features that are greyed out, to turn them on see the steps after upgrading the console the bottom of this guide. Continue through the wizard until completion at which point the update will be listed with a state of Installing. You can review the installation status by clicking on View Status. At this point you can use CMTrace to open the CMUpdate.log file in <drv>\Program Files\Microsoft Configuration Manager\Logs (where drv is the drive letter you installed ConfigMgr on) to monitor the installation live. Note: The CMUpdate.log will take some time to start logging the installation of the update, so be patient if nothing appears to happen, it will. Look for a line similar to the one below to signal that the update has begun. Detected a change to the "E:\Program Files\Microsoft Configuration Manager\inboxes\cmupdate.box" directory. Keep monitoring the CMUpdate.log file to review details of what the update is doing. Once the update is complete, you should see a hman notification in the log . Note: If you don’t see this and see an upgrade failure message then scroll up in the CMUpdate.log file to determine what the failure reason was. You can always retry an upgrade (maybe not enough available ram for example). You can also verify the status in the monitoring node or click on Show Status in Updates and Servicing. You can click on any state to get details of what is happening at that time (tip: hit refresh). After the update is complete, click refresh in the console and you'll be reminded to update the ConfigMgr Console via a popup. Make sure to update your console as you cannot use the new features until you do. 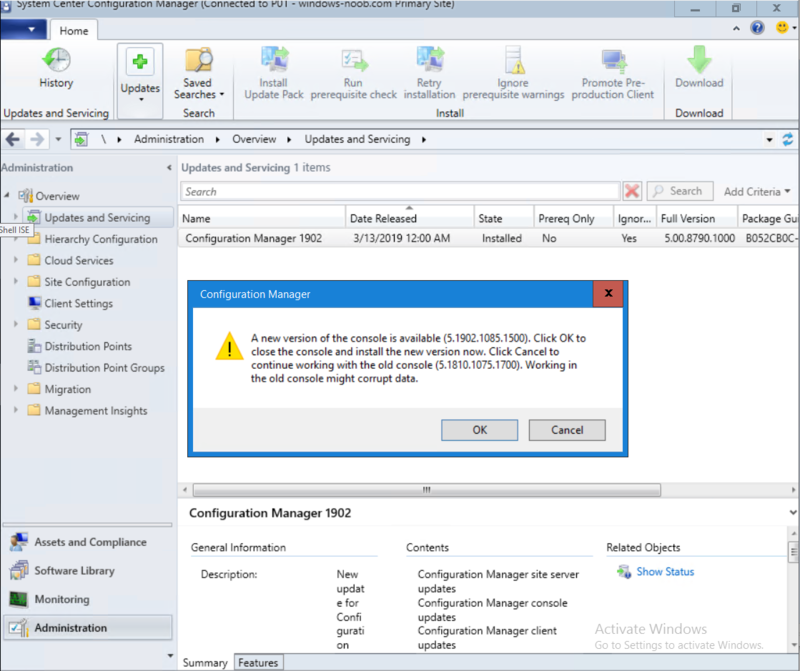 Click OK to upgrade your ConfigMgr console, and after all is done you’ll see the 1902 version listed in the console. 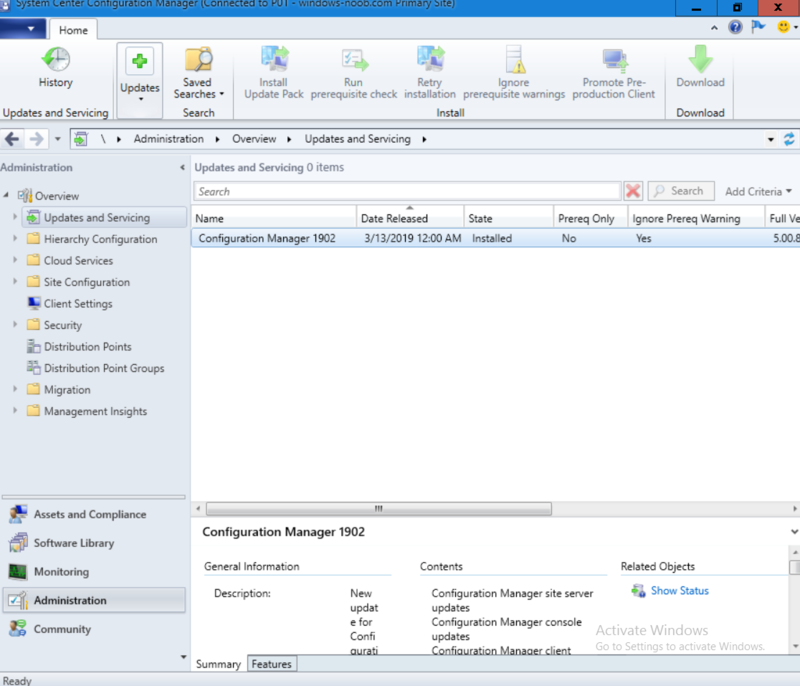 The new version of ConfigMgr is 5.00.8790.1000. Tip: If you want to gain access to the Pre-Release features, then select Sites, Hierarchy Settings, and place a checkmark in Consent to use Pre-Release features. Then go to Overview, Updates and Servicing and expand Features as shown below, you can then turn on (or off) any of the Pre-Release features you want to test in Production.